Weary, elderly and disillusioned, Thrór departed from Dunland with Nár. They came to Azanulbizar and the Eastern gate of Moria, which they found was open. Whilst Nár stayed behind (and urged his companion to do the same) Thrór approached and entered the gate, and was murdered by Azog. He added insult to injury by branding Thrór's brow with the name 'AZOG' in Dwarf runes. Thus it was that the War of the Dwarves and Orcs began following the return of Nár, who bore the news to Thráin. Therefore Gandalf invited Thorin and other Dwarves to Hobbiton of the Shire, instructing them to look for a smial whose door was marked with the sign of the thief (as the dwarves had gotten it into their head that Bilbo was a thief). Thus Thorin found himself in Bag End, where they perused the hobbit's hospitality. However, Thorin and the dwarves were not convinced; it was not until Gandalf revealed Thrór's Map and key that Thorin was convinced that the quest would be profitable to him. Even after the 'Unexpected Party' Gandalf only persuaded Thorin to take Bilbo on the morning that they set off. Upon reaching Esgaroth, the closest settlement to the Lonely Mountain, Thorin was greeted warmly and the men of Lake-town hailed the return of the King under the Mountain. They soon reached the Lonely Mountain itself and “with the last light of Durin's Day” they found the secret side-door, using the key to open it. Thorin sent Bilbo in to carry out his duty as their 'esteemed burglar'. This enraged Smaug who sought to destroy the burglar and take out his vengeance on the Lake-men. The dragon was slain by Bard who pierced an un-armoured spot on the dragon's underside. However all disputes were cast aside when the army of Bolg, Azog's son, suddenly attacked. Thus the three armies of Elves, Men, and Dwarves united against the two armies of Goblins and Wargs: the Battle of Five Armies had begun. As the battle drew on, Thorin leapt from the front gate and rallied all Elves, Men, and Dwarves to him. The armies of the free peoples of Middle-earth emerged triumphant. Nonetheless Kíli and Fíli were killed and Thorin was gravely wounded. On his deathbed Thorin apologized to Bilbo for his angry words and deeds. He commended his good character, courage and friendship, saying that “if more of us valued food and cheer and song above hoarded gold, it would be a merrier world.” With that, he died. He was laid to rest deep within the Lonely Mountain. Bard of Dale placed the Arkenstone upon Thorin's chest, whilst the Elvenking laid Orcrist upon Thorin's tomb. 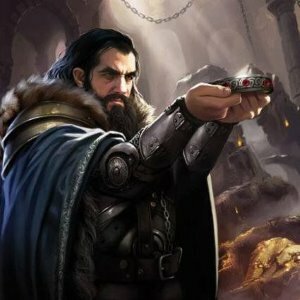 Thorin was capable of being stubborn, proud, and greedy. According to Gandalf he was, from the beginning, contemptuous about the notion that Bilbo should go with him on his long-desired adventure to the Lonely Mountain; he thought that Gandalf was trying to mock him and make him look foolish. Indeed, Thorin found it difficult to accept the advice of Gandalf at all, believing that he should have been drawing plans for war and battle rather than planning to use a Hobbit as a burglar. But he gradually came to respect the Hobbit's value to his quest, as Bilbo again and again proved his stealth and courage. Thorin's most coveted prize was the Arkenstone, something which Bilbo believed was not only the heart of the mountain but the heart of Thorin also. Thorin's name is one from the Dvergatal. It means 'Bold'. 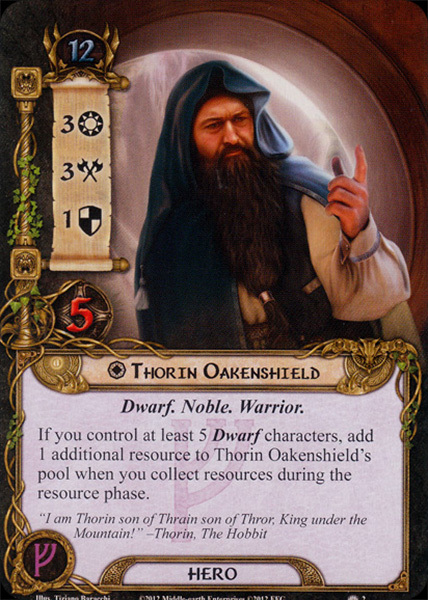 The epithet 'Oakenshield' also comes from the Dvergatal. Eikinskjaldi means 'Oakenshield', and it has long been considered the name of a Dwarf. However, because the name appears twice, both in Dúrinn's and Dválinn's line, it has also been suggested that it simply means 'with an oaken shield'. In early manuscripts of The Hobbit, the name Gandalf was used by Tolkien for the character who later would be named 'Thorin Oakenshield' in the published works.